Led Zeppelin turned me on to rock and roll 40 years ago. In 1976, I was 13 years old. My family had settled into a new home in Wheaton, Illinois, after moving from Battle Creek, Michigan, the year before. Music figured large in our lives. My older sister Karen enjoyed disco. I dealt with the loneliness of being a new kid in town by immersing myself in books and music. I was a huge fan of soul (especially Al Green), funk, R&B, and jazz (especially George Benson). Everything I knew about rock was based on what I could hear on singles-friendly AM radio, which meant a lot of soft rock along the lines of “Chevy Van” by Sammy Johns. I knew who Led Zeppelin was because my older brother, Dan, owned all their albums. But Dan listened to music in the privacy of his bedroom, lost in a world defined by his collection of rock albums, black felt posters, and books about World War II fighter planes, and, it seemed, secrets I would never know. We lived in the same house but in two different rooms on different floors of the house, our doors always shut to each other. My life changed one day when Dan and I were the only ones in the house. I was in my own room reading a book about baseball when I heard this strange, exotic, powerful tune wafting up from our family room downstairs. It sounded as though a collection of Middle Eastern musicians had decided to entertain themselves in our home. I tried to focus on studying baseball statistics. But the song just kept rising into my room like a dust storm from the desert. The tension built with each refrain, as strings, guitar, and a distorted drum complemented a man’s voice crying with angst. I put down my book and cautiously walked downstairs. With each step toward the family room, I felt the rush of drums, guitars, and strings engulf me. Dan stood before me, his eyes locked on the vinyl record spinning on our family console stereo, a monolithic beast that housed my dad’s collection of Herb Alpert and the Tijuana Brass. We spoke no words after that exchange. We just stood together and immersed ourselves in the song. Afterward, Dan wordlessly shared with me the album that had produced the song, Led Zeppelin’s Physical Graffiti, which had been released the year before. I was accustomed to album jackets that contained one simple pocket. 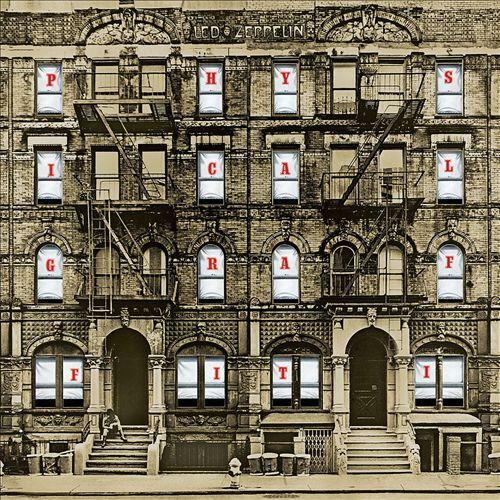 Physical Graffiti was something completely different: a sepia-tinged photo of a New York tenement building with the name of the album formed by die-cut letters peeking from behind different windows. The jacket housed two albums protected by their own sleeves fashioned to look like the cover. The tenement windows were adorned with a hodgepodge of images including band members, Queen Elizabeth, a bomb dropping, and Elizabeth Taylor in Cleopatra. And the music inside would turn out to be a revelation. I began to explore the band my brother loved. Physical Graffiti was an excellent introduction because the album destroyed every stereotype I held about the band. I had assumed Led Zeppelin was a group of heavy metal rockers, and I was quickly disabused of that notion. “Custard Pie” made me want to dance. “In My Time of Dying” felt like gospel. “Trampled Under Foot” resonated with my love of funk and soul, and the bucolic “Down by the Seaside” was certainly nothing close to hard rock. Listening to “Kashmir,” on the other hand, was like journeying to another land and time. As a showcase of the many sides of Led Zeppelin, the album opened up my eyes to the diverse nature of album-oriented rock in the 1970s. As it turned out, my brother’s world was not as private as I thought it had been. Although he did not exactly encourage me to hang out in his room, he didn’t discourage me, either. Crucially, he allowed me to explore his album collection, including all the classics: The Dark Side of the Moon, Sticky Fingers, Who’s Next, and Fragile just for starters. Rock and roll would loom large in my life from that point forward. I got caught up in the Doors revival of the early 1980s and visited Père Lachaise Cemetery on the 10th anniversary of Jim Morrison’s death. The music of Pink Floyd helped me endure some of life’s ups and downs and created more moments of bonding with Dan, as I discussed with the leading Pink Floyd fan website, Brain Damage. I edited a book about the history of rock and roll and began writing about music extensively on my own blog. Rock has become a lifelong passion, and I can trace that passion all the way back to the moment when my older brother and I shared Led Zeppelin for the first time. This entry was posted in Music and tagged Classic Rock, David Deal, Kashmir, Led Zeppelin, Physical Graffiti, rock music, Superhype. Bookmark the permalink.